So back in 2002, Marvel decided to have a month where all their titles’ stories had no dialogue. The gauntlet was thrown down to their writers and artists to tell compelling stories with as few words as possible. I say “as few as possible” because some of the titles screwed around with this concept as much as they could (writers would have characters write or type to others; one book even had a character create letters out of thin air to smart-mouth another), but many held fast to the idea with comics that don’t have a word in them. Each issue would even end with a copy of the writer’s script showing what he relayed to the artist for the tale. I might love this more than most; I’ve always been kind of a dork for comic scripts and reading how writers imagined their pages to lay out—probably because I can’t draw worth a damn myself, and I like seeing how others express their visual cues. On the whole, it’s an interesting concept—like the television show that has a random musical episode or movies completed from beginning to end in one continuous shot—that stretches the creative muscles of the team. The work of “‘Nuff Said Month” was later deemed successful enough to merit a collected edition trade paperback. Included in this trade are Amazing Spider-Man #39, Peter Parker: Spider-Man #38, New X-Men #121, X-Force #123, Incredible Hulk #35, Thor #44 and Punisher #7. What’s somewhat frustraing to me about this collection is that the stories are all art-centric, but two of these books feature artists whose work I am not a particularly big fan of (Frank Quitely on New X-Men and Mike Allred on X-Force, and YES I KNOW not liking those two is comic book blasphemy, but their work was always just a bit too stylized and goofy for me. Throw your stones, I can take it). The Amazing Spider-Man issue—which takes place during J. Michael Straczynski’s run, which I did like a great deal despite, you know, “Totems!” and “Magic spiders of destiny!” and “Gwen Stacy had Goblin babies!” and everything—is a three-piece story focusing on, at turns, Mary Jane, Aunt May, and Spider-Man. This particular issue always felt a bit like cheating to me because the Aunt May section has bunches of words in it as she reads newspaper headlines and sends a bunch of emails and keeps a to-do list, but eh… you do you, Staczynski. This was in the wake of her discovering Peter is Spider-Man, and the erasure of that was the second worst thing about One More Day; J Mike put a lot of care into making May a powerful character after years of being a one-dimensional helpless old lady. 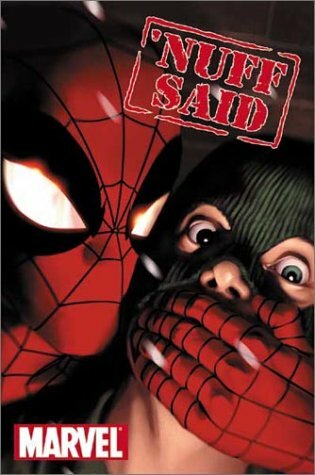 The other Spider-Man tale, from the Paul Jenkins era of Peter Parker (and I dug his work, too, for the way he could balance heartfelt emotional tales with absurd silliness), has a plot for a comic sans dialogue that is right on-the-nose: Spidey is attacked by a gang of criminal mimes! Out of the entire collection, this is my favorite issue because it tells an effective silent story while also sideways heckling the entire notion. And come on… Spidey wins by locking the mimes in a big, glass box! It’s just so obvious. The two X-books in the collection were somewhat misses for me, and they both tend to be rather surreal. First, we have the biker gang era of X-Men, and oh man! Maybe I’m just elderly, but that black leather period doesn’t actually seem like it was that long ago. I did not care for this book when it was being published (though that was more due to the artist than any fault of Grant Morrison’s), but when I caught up on it years later, I found that it did such a good job soft-rebooting the X-Men after all those horrendous late-90’s arcs. Here, Jean Grey and Emma Frost journey into a comatose Professor Xavier’s mind, find angry doors and an island fortress, and take a psychic journey directly back to Xavier’s mother’s womb to see Cassandra Nova gain awareness and try to kill her twin. If possible, the X-Force story is even weirder: it’s about Doop popping a pimple on his forehead. So he pops his pimple, the team all get absorbed into his head, and… look, if you can tell me what’s happening in this story, more power to you. I never read this age of X-Force, so I don’t even know these characters, much less what is going on in Doops MC Escher mind. Rounding out the collection are stories from Incredible Hulk, Thor, and Punisher. The Hulk story (which features John Romita Jr on pencils for the second time, and I’m curious why they chose this instead of allowing another talent from the month’s books to be featured in this trade) sees Bruce Banner on the run from government agents. The agents catch him, which goes about as well for them as you’d expect, and Bruce meets a young autistic girl in a diner. He also has a dream about the little girl and a beached whale and MAN did these silent stories like taking us inside characters’ minds. The Thor issue takes place in the wake of Odin’s death, and it gives us a glimpse into how the more relevant Asgardians viewed the All-Father: Thor knew him as a compassionate father, Balder remembered him as a silent, omnipresent protector, Sif recalled him as a virtuous defender, and Loki saw him as a judgmental, repressive father. At the end, Odin’s body is given a Viking send-off, and Thor takes up the mantle of king. The Punisher story? Well… it’s a Punisher story. There’s a drug dealer. Punisher kills him. The standout here is the attached script. Since Steve Dillon did the writing and art, his “script” is little more than scrawled notes with one sentence describing an entire page, or pages (such as “Punisher and bozo at a bar”). +Again, I think the attaching of the scripts is a fantastic idea. Not only because you get to see how an artist interprets what a writer imagines, but you get to see how each writer differs in his laying out of the plot. Some are a lot more detail-oriented, while others leave the artist some leeway to create his own panels. +Change is good, and it’s usually wise to change up the routine every now and again, especially for a big company like Marvel that tends to play it safe rather than trying anything too radical. Instead of just another issue of Spider-Man punching bad folks, we get something of a new spin on it and a new way to enjoy it. -For a collection based on art, they sure included a lot of artists I was not a fan of. Obviously, your mileage may vary, but Quitely, Allred, and Romita Jr aren’t my flavors, but even the others in the trade just aren’t exactly stand out. I’d always rather read a poorly drawn book that is well-written than the opposite, but for these stories, I would have wanted stronger penciling across the board, and it just wasn’t a strong fascet of Marvel at the time. -Because this idea was thrust upon the writers from on high, the concept was twisted to fit whatever story the writer already wanted to tell, so in a few instances, having no dialogue just doesn’t make sense. The story this concept was drawn from, an old issue of GI Joe featuring Snake Eyes, was based around the idea of silence and stealth, so it made sense. Here, it seems a bit “Why doesn’t Punisher have anything to say this week?” In this sense, the experiment comes across as not truly organic. The like the idea, even if the execution wasn’t great. I’d like to see more months like this where all titles take a theme and run with it. Something better than Marvel’s current gimmick, which seems to be “Tell joyless, convoluted stories, and make sure everything is the absolute end of the world”.